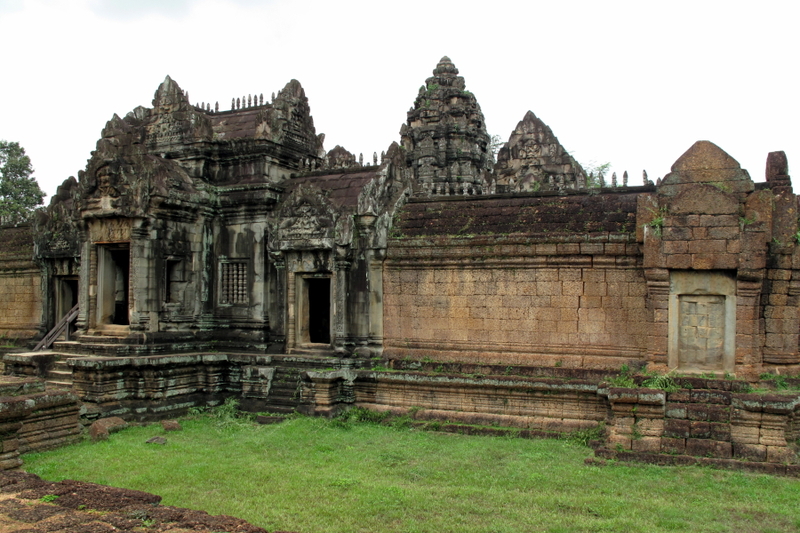 The Angkor Wat era temple of Banteay Samre lies just outside the eastern wall of the eastern baray. It's a bit out of the way, but worth it for some impressive architecture, which you might have all to yourself. Access is usually from the main road on the north side of the complex. The complex is fairly complete, except for the usual missing decorations. It is all on one level, with an outer and inner wall, each with a gallery. A long formal causeway leads up to the eastern gateway, and there are also gates on each of the cardinal points of the outer and inner walls. The inner courtyard appears to have been designed to hold water, although it's now dry even in the wet season. On either side of the eastern gate passage to the central sanctuary are small structure generally thought to be libraries. The central sanctuary is accessed on the east side through a large hall. The exterior of the sanctuary is particularly fine, with some nice details such as finials still seen on the peak of the gable. The name Samre refers to a possibly pre-Khmer ethnic group that occupied the area around Phnom Kulen, further east of the temple. No inscriptions or other information has been found giving any details about this temple.